Episode two hundred and thirty six (typing it out sounds bigger!) of the Global From Asia interview series. Things are rocking and rolling here so much growth and pushing of limits and boundaries – and it is very timely to get our guest on the show – finally! 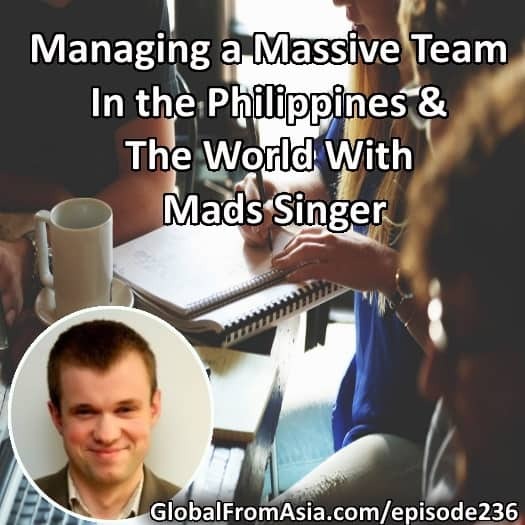 Mads Singers – a management pro and someone I look up to and have been learning from over the years is a guest on our show! Managing a few businesses of his own as well as a management coach and consultant – it is a pleasure to bring him on the show! It is about time we got you on the GFA podcast – how are you doing today? For those who don’t know you – can you give us some insights. That is what I have been feeling lately – if you are doing the work yourself – you are a specialist – and that is fine -but until you build a team and have others doing the work- you don’t have a real business – am I right here? How Does One Start the Journey To Managing People Vs Doing Themselves? What is needed to get to this point? And what is the daily workflow requirements / what is a day of a manager look like? I’ll be honest – one thing I sometimes worry about is – am I giving all my information to the team – is there any risk – I mean the logins, access. When is it too much information? How to know what information to give to what team member, and what should you not delegate? Is it all about KPI? How do you pick a KPI for a person, a department? The Main way someone should keep their company on track. Can you give some examples of people you have coached – since a lot of listeners are in Amazon FBA / product based businesses – maybe you can share how sellers are being better managers? What are you upto - how can people work with you - find more online? Thanks Mads for sharing – this is great – how can people find more? Thank you Mads for coming on. One of the cool things about hosting an interview show is you get to ask questions you are curious about for yourself and your own business – and that is what we did here. Global From Asia has been investing heavily in our own teams and systems and pushing limits. One thing I do give credit to Mads about is when I learned to delegate RESPONSIBILITY not just “tasks”. Telling someone to “do this, do that” is one thing, but when you step back a bit and say “your job is to get the podcast online every Tuesday at 10am” – that is when you really get to the next level of management – and that has been happening here at Global From Asia for most of 2018 now. SO thank our amazing team for having this show online, on time, and in good quality – I am “just the dude with the microphone” now – and have an amazing team to thank for taking care of the rest. Over and out, see you in the next show.